By far the most highly touted free agent this year has finally found himself a new home. Former Yankees 2B Robinson Cano has reportedly signed a 10 year $240M deal with the Seattle Mariners. The Mariners landed by far the best 2B in the league. He hits for average, hits for power, gets on base, plays great defense, all while playing at a premium position. Any given game, Cano’s team has a sizable matchup advantage, and that is invaluable. Sounds enticing. But looking closely, it wasn’t a homerun of a deal. 10 year deals for players don’t work out. Flat out, they never do. There’s maybe 5 or 6 guys in the whole league that could net a $200 million deal and it’d be a smart team investment. And none of them are 31 years old. 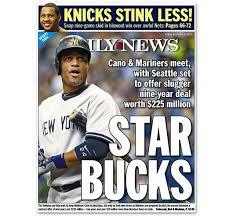 Cano will make on average $24 million a year over the life of the deal. At 31 now, Cano will probably live up to that slalary for maybe the first 5 years of that deal, if the Mariners are lucky. After that, he’ll be worth slightly less, and during the last 2 years or so, he’ll most likely be no more than a nuisance and liability. The Mariners have some interesting pieces right now. Felix Hernandez is still elite. Hisashi Iwakuma will try to build on a stellar 2013 campaign, and Taijuan Walker is set to take on a full rotation role, assuming he isn’t traded for David Price. But regardless of that deal, the Mariners will have one of the best 1-2-3 punches in the game. The offense leaves much to be desired, but Cano is a great start. With the TV deal and low payroll, Seattle has plenty more to spend. They could sign Shin Soo Choo or Nelson Cruz to man one of their open OF positions. Seattle has options, and they’re moving in the right direction for the immediate future and the next few years. It’s the years following that will provide some obstacles to overcome. Should Rookie Stars Play Over Returning Veterans?